Van Egmond Ornamental Bark consists of fresh bark of North-European pine trees. Ornamental Bark is colored light brown and is softer compared to Bark Nuggets. Its soft structure will cause the bark to waste away faster than Bark Nuggets, so it will not last as long. Ornamental Bark is mainly used for establishing footpaths, as decorative material in the garden, and as covering or surface material in playgrounds. 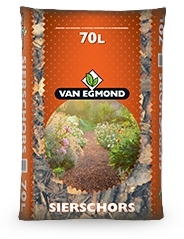 Van Egmond Ornamental Bark is available in bags of 70 litres. Order ornamental bark directly through our order form!